"View of the greeting of the Smolensk Mother of God in the city of Kazan": Every year the Sedmiozhernaia replica of the Smolensk Mother of God icon--a sacred relic reputed to have saved the city from more than one epidemic and disaster--was brought into the city for several weeks of processions and ceremonies. Thousands of residents would make the overnight trip, on foot, to accompany the icon; and thousands more would line the steep hillsides of the Kreml to greet its arrival. 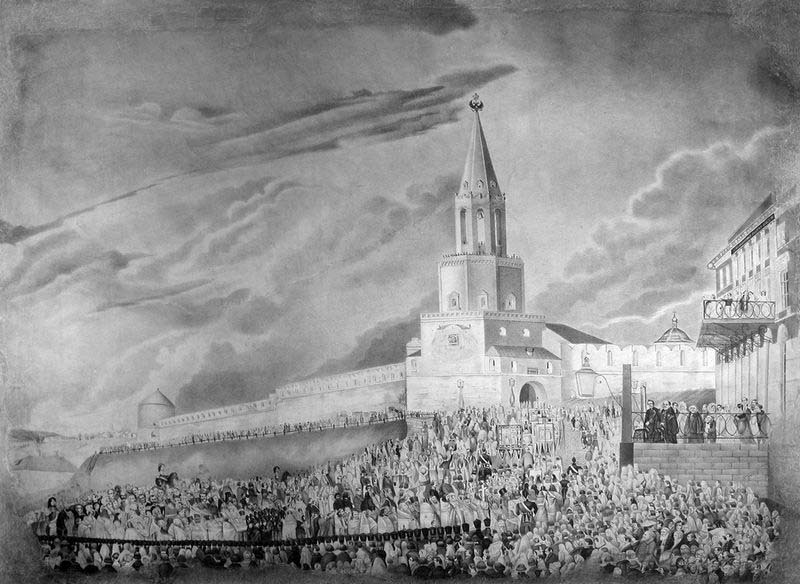 N. Roze, “Vid vstrechi Smolenskoi Bozhei Materi v g. Kazani,” Kazan 19th c. - Urban explorations of a nineteenth century Russian provincial capital, accessed April 21, 2019, https://kazan19c.com/items/show/27.